HORROR FIND: The used syringe was found inside the parents room microwave. A BUNDABERG mother found a syringe inside a microwave used to heat babies' bottles today. The woman said she alerted security staff at the shopping centre, who then informed management and cleaning staff. "The cleaners had to search the bin where they found a backpack with the wrapping from the chemist, a water bottle and a heap of rubbish in the bin in the parents' room,” she told the NewsMail. The woman said she was repulsed. "I am a mum to a six-month-old and regularly heated her bottles in that microwave. Public reaction to the woman's find, which she posted about online, was fast and furious, with many of the comments unpublishable. 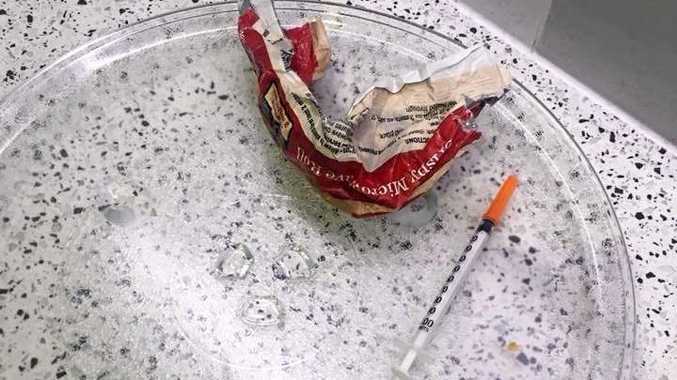 "Even other addicts hate scum like this,” one person commented in reference to whoever left the needle inside the microwave, along with a food wrapper. Hinkler Central centre manager Renee Pukallus said the microwave had been removed and would be replaced. "The comfort and safety our guests is our highest priority and our parents room is inspected and cleaned in 20 minute intervals during the centre's operation,” Ms Pukallus said. "As soon as we were made aware of this matter our team removed the microwave, disposed of it in an appropriate way and thoroughly cleaned the area,” she said. Ms Pukallus expressed her disappointed over the issue. "While we do all we practically can to maintain our parents rooms, we also rely on our community to use these complimentary facilities appropriately, and we are disappointed by the actions of this person or persons,” she said. Failing to safely dispose a needle is an offence punishable by up to two years in jail in Queensland. To safely dispose of a needle, it either must be placed inside a puncture-resistant, rigid-walled container that is sealed or secured shut, or it must be given to a medical practitioner, pharmacist or a person authorised to collect needles under law. Queensland Health provides the following information about disposing of sharps. You can buy an Australian standard yellow sharps container from a pharmacy, or you can use a strong container that cannot be pierced by a sharp, made from heavy/thick plastic and with a tight fitting or childproof lid, for example a plastic bleach bottle. (Do not use glass or aluminium containers as they are not puncture/shatter resistant). Write the words "Not recyclable - contains sharps” on the container with a black permanent marker. Do not over-fill the container with sharps. This can increase pressure on the lid and cause the sharps to spill out. Secure the lid to the container with heavy-duty tape such as electrical or duct tape. You can dispose of Australian standard yellow sharps containers at the collection points shown on the Pharmacy Guild's website.